I have seen these in the woods. We even had one try to break into the house one summer night! They are the stuff of folklore and woods legends. Don't believe everything in this article: fisher cats DO eat housecats! The fishers we see are black and very big. Like the size of a small dog. In New England, fishers are called fisher cats. They often look like huge cats from afar (and they eat cats). A formidable predator lives amongst us, one we almost never see. I've gotten only a few close looks at fishers during my years in the Northeast Kingdom, but once seen, these powerful creatures leave a lasting impression of alert intelligence, strength, and a don't-mess-with-me attitude. My successes have been mostly along back roads when a fisher crossed from one densely wooded tract to another. They don't tarry, although one stood its ground and glared as my car inched forward, hissed and growled before turning to gallop hump-backed into the pine woods, its gait clearly showing relationship to the smaller, more sinuous weasel. I was glad to be inside the car. A fisher is one of the largest mustelids, a family that includes not only weasels, but martens, ferrets, otters, and the immense wolverine. Interactions with humans are rare and not of the animals' choice. Despite weasels having been kept in 1st Century European farmhouses to provide needed pest control, mustelids - especially mink, ermine, and sable - have been hunted for their lustrous pelts for at least two thousand years. Jason's Golden Fleece may have been glowing sable fur, a valuable commodity in ancient Greece. The crowns of 17th Century Russian kings, including Czar Boris Gudunov, consisted of sable hats ornamented with jewels and gold. Over 40,000 sable pelts were once sent to Vienna in a diplomatic exchange of goods, and hundreds of thousands of pelts were traded annually in the 18th Century. The glistening white winter coat of ermine, an animal originally from England, was used for royal capes and robes. Our local weasels turn white in winter, and while we call them ermine, they don't have the gleam of European ermine. In some areas of North America hunters and trappers have brought mink and the marten (the continent's most valuable fur animal) close to extinction. In the late 19th Century, for example, about 120,000 marten pelts were traded each year, but by 1930, the total barely reached 800. Today mink are raised in cages to be "harvested" for their lustrous fur. What of the fisher? Because of its reclusive nature, sparse population, and relatively coarse fur, the fisher has been largely spared the fate of its close marten relative and smaller mustelid cousins. Nevertheless it too has been hunted and extirpated in many places, although protected in others. Because its original range in northern New England is returning to the heavily forested habitat it requires, its present wide distribution appears stabilized. Myths and tall tales revolve around fishers. They don't rob fish traps and have little to do with water, although they are capable swimmers. They don't shun trees as some have claimed, but are agile climbers; females create cavity nests high in conifers where their young are born and raised. 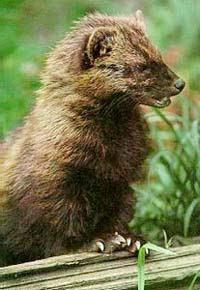 A fisher isn't related to cats, although "fisher-cat" is commonly heard here in the Northeast Kingdom. Fishers don't kill deer, despite an occasional hunter's claim. Yes, the animal may munch on a deer carcass, but what free-loading carnivore won't if meat is conveniently at hand? A fisher is impressive enough without such hyperbole. Females weigh seven or eight pounds, but a truly big male, 3-1/2 feet long including the furred tail, can weigh as much as 18 pounds of solid bone and muscle. That is more than a red fox, and no sensible fox will ever tangle with a fisher's fury. A fisher and the smaller marten are the only sizable North American predators capable of climbing trees and entering ground burrows, making them versatile hunters. The fisher is built for business, with a long heavily-muscled body, broad flat head narrowing to a pointed face, and stubby rounded ears that don't get in the way of confined spaces or fighting. Its short legs end in sharp curved claws that are capable of a lot of damage. Still, when seen close-up, it is a handsome animal with a dense dark brown coat, lighter under the throat and grizzled with silver or gold on head and shoulders. A fisher works a territory of 10 square miles or less, an area determined by the prey it seeks. Its scent-marked boundaries are respected by others of its kind. Despite its size and weight, it can out-climb red squirrels that figure largely in its diet. Chipmunks, snowshoe hares, mice, voles, and shrews are other staples, but fare is not restricted to them. Reptiles, birds, insects, carrion, even berries and fruit are devoured when found. Despite its name, the only fish this mustelid is likely to eat is discovered dead on a shoreline. Its real claim to dietary fame is a fondness for porcupine and an ability to repeatedly attack the face of one of these lethargic creatures, confuse and tire it, then flip it over and rip out the throat and belly. Out here in the wooded countryside fishers are notorious for disposing of domestic cats, commonly available because many are put out at night, an adage for which there is neither reason nor merit. 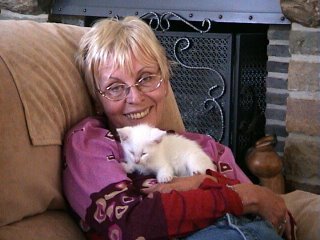 Neighbors have lost "outside" cats repeatedly, and I keep hearing of others in the Kingdom whose pets have mysteriously failed to come home after a night out. One owner found the carcass of his cat torn to shreds partway up a tree - no coyote did that. The solution, of course, is to keep cats indoors, where they thrive. The thicker and more continuous the forest habitat for a fisher, the better. It prefers a good overhead canopy to darken and dampen the ground. Trees should be mostly coniferous (spruce, cedar, fir and white pine), with only a scattering of hardwoods. The animal occupies and defends holes and dens originally dug by other creatures, also brush piles, hollow logs and stumps, keeping several as way stations and rest stops. Winter dens can be burrows in deep snow. In dense woodland, a fisher may travel along fallen logs, where sometimes you find bark and soft wood ripped up from their searches for insects and mice. I sat for hours in a blind near one large log, hoping to photograph a secretive fisher passing along this forest thoroughfare - an exercise in futility. The fisher is a loner, sociable only when breeding season arrives in March and April. Mating is a short, noisy affair with the male only partly successful in quieting the female by a strong bite to her neck. After this romantic interlude they go their separate ways and stay that way. Gestation requires almost exactly a year, but this is because of delayed implantation of the fertilized eggs, an advantage when taking into account the care of older young. Two or three (sometimes five or six) young are born in the spring, and within a week or two the female mates again while the helpless, blind young are still suckling and dependent, as they will be for almost two months. Even after being weaned, young fishers remain with their mother until fall, when they go off on their own. With luck, they can live more than a dozen years, although eight or 10 years are more likely. Because they are remarkably disease-free, survival depends largely upon a lack of human intervention and habitat destruction. With a leisurely mode of reproduction and extensive territory necessary to support even a single fisher, they have never been very populous, even under the most favorable conditions. The fisher I've seen near our house may not show itself again for a long time, even though it is likely to pass this way often. It is a reclusive neighbor at best, and its crossing spot is only a fragment of a much larger territory. Within the hour "my" fisher could scamper past the house intent on finding prey in the dim surrounding woods. But I'll never know. Bill Amos is an author and retired biologist who lives in St. Johnsbury. He has been a frequent contributor to National Geographic. I thought it was cat carnival and your cat had put a costume on, lol ! I don't know these animals, have heard of them, they don't look very cosy indeed ! The face reminds me of a Tazmanian Devil and if it eats house cats, then it must be a bit of a devil indeed. I would keep my cats inside... perhaps the dog too. Those claws could do some damage. Cool! But I would hate to run into one. It looks quite mean! I've never heard of a fisher cat before! Thanks for the information - I enjoyed learning about these animals. I'm glad I'm an indoor-only cat, so I don't have to worry about a fisher taking me! I've never heard of these creatures before. I think I'd be having "house cats" if I had those living in my neighbourhood !! Thanks for sending me to this article, Andree, when we were discussing the identity of one of your sightings. Bill Amos' observations (especially the fisher vs. porcupine material) mirror info in Wikipedia and I wonder if he contributed to the listing there. For the record, I should mention what we talked about regarding "nocturnal" habits of various creatures. Carnivores like the mink, marten, and fisher have sometimes been described as being nocturnal hunters, but my sources in the natural resources area (conservation officers and park rangers) generally agree that the habits of PREY animals dictate when carnivores hunt, and where. The prey learn that daylight hours are dangerous times and shift their activities to safer twilight hours, and the PREDATORS shift their hunting times in response. This is what gives rise to blanket statements about nocturnality. In point of common fact, predators cannot afford to be picky, and will hunt whenever and wherever they must to get food.